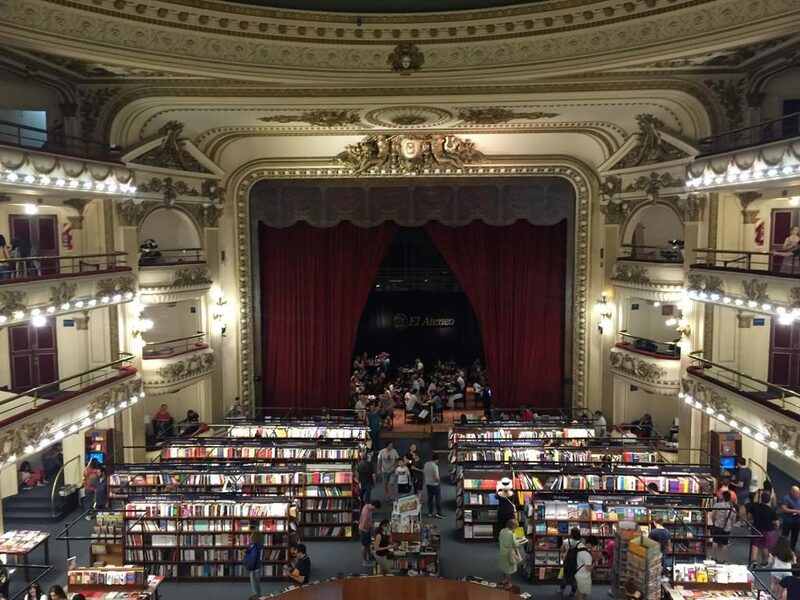 El Ataneo Grand Spendid is considered the most beautiful bookshop in the World. In 2019, it was named the “world’s most beautiful bookstore” by the National Geographic, and made it to the 22nd position of the Top 25 landmarks in the World of TripAdvisor’s travellers choice. The venue even gave birth to its own radio station, LR4 Radio Splendid, which began transmitting from the building in 1923. In the late twenties the theatre was converted into a cinema, and in 1929 showed the first sound films presented in Argentina. 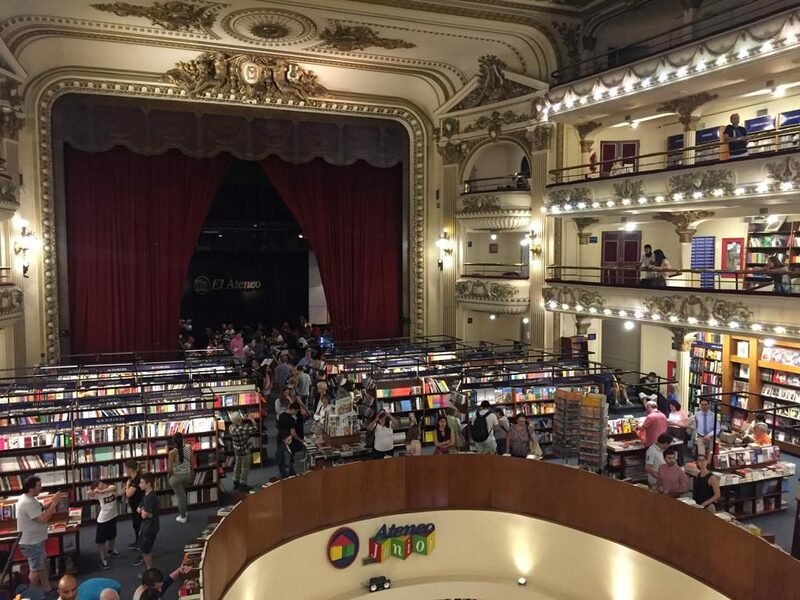 The ornate former theatre was leased by Grupo Ilhsa in February 2000, who owns El Ateneo and Yenny booksellers (they have over 40 stores in the country), as well as the El Ateneo publishing house. The building was subsequently renovated and converted into a book and music shop, the cinema seating was removed and in its place bookshelves were installed, as you can see in the pictures above. Chairs are provided throughout the building, including the still-intact theatre boxes, where customers can dip into books before purchase, and there is now a coffee shop on the back of what was once the stage. On both sides of the coffee shop, there are two small reading rooms. The ceiling, the ornate carvings, the crimson stage curtains, the auditorium lighting and many architectural details remain. Despite the changes, the building still retains the feeling of the grand theatre it once was. 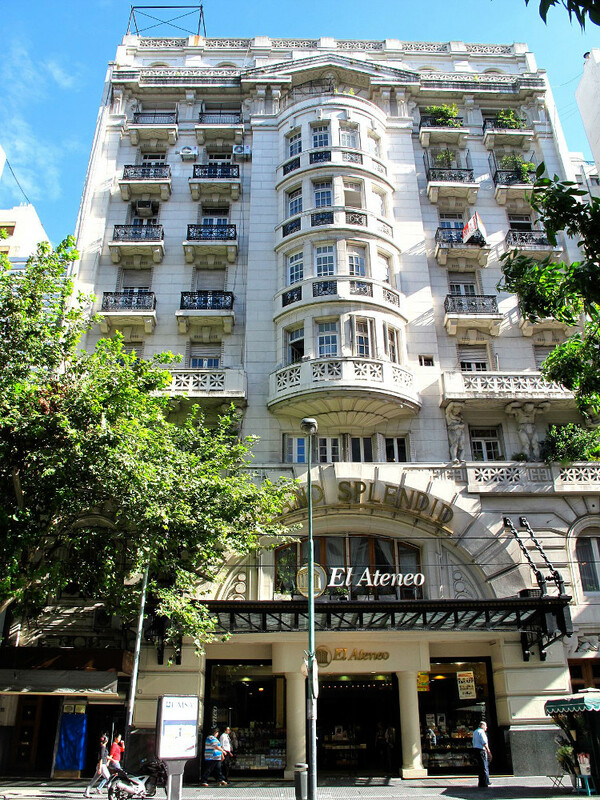 The bookshop is located a few metres away from one of the most popular corners in Buenos Aires, where Sante Fe and Callao avenues meet. The easiest way to get there is by the metro, and the closest stations have the same names as the avenues: Santa Fe (H line) and Callao (D line). Both stations are only 7-9 minutes of walking distance. If you prefer the bus, there are plenty of options in both avenues: 12A, 12B, 39A, 39C, 39D, 39F and 152A on Santa Fe; 12A, 12B, 37A, 37B, 37C, 124A, 150A and 150B on Callao. Bear in mind that you need the SUBE card (similar to the Oyster card in London) to use the transport. The city official website offers a lot of information and mobile apps so you get around easily. Other points of interest nearby are The Medicine of School of UBA (Universidad de Buenos Aires), The Ministry of Education and The Recoleta Cemetery.